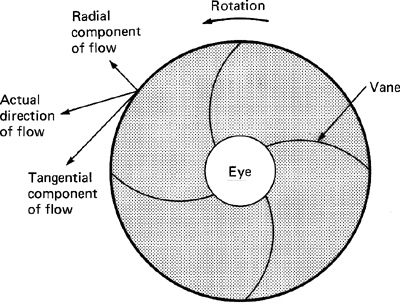 The rotating member of a turbine, blower, fan, axial or centrifugal pump, or mixing apparatus. Also known as rotor. The rotating member in a pump consisting of a disk with vanes attached to it; moves liquid by accelerating the liquid radially outward. i. A part of a gas turbine engine used in the compressor section. It consists of a forged disc with radially opposed vanes on one or both sides, forming a convergent passage in conjunction with the compressor casing. ii. A device that imparts motion to a fluid; specifically, in a centrifugal compressor, a rotary disc that is faced on one or both sides with radial vanes and accelerates the incoming fluid outward into a diffuser. Also called an impeller wheel. iii. A vaned disc, which picks up and accelerates the air outwardly to increase the pressure in a supercharger of a reciprocating engine. The more accurate the impeller, the higher its efficiency and the easier it is to comply with auto mileage and emissions standards," Kevin Uhlig, vice president of Moore said. No specific rules exist for impeller size relative to tank diameter, although the diameter of a typical portable impeller is about 15 percent to 30 percent of the tank diameter. Initial speculations regarding the cause of the failure included corrosion, an unbalanced rotor, a factory-defective rotor, foreign material entering the impeller and sabotage. He further illustrated that, one can rise the pump's output head by controlling and reducing the impeller friction losses, shock losses, disc friction losses, volute friction losses, and recirculation losses. In instances where there is a high level of abrasive particles but low Chloride content (hence minimal corrosive effect), the use of standard pump materials combined with a hard iron impeller and Insert Ring will prolong the expected lifetime of the pump. A series of commercial sieves were modified to make up the flow plenum from which the impeller drew air. As a result of impeller replacement, capacity of the second hydropower unit will increase by 10 MW to reach 95 MW. Our [Impeller] Model 270 is the fifth new impeller introduced this year," company CEO, Carl Forsythe, pointed out. The aim is to determine the power required turning the impeller in a biodiesel production stirred tank reactor, mechanical design of an agitator such as stress analysis by analytical method and numerical one (finite element method) and compare the result of both methods. This mid-unit- cell surface, a surface parallel to the impeller base and situated at half the blade height, and the exterior surface of the aluminum blades are colored by temperature.